The Noise Pop Film Festival opens today (Friday). And Cinequest opens Tuesday. And the Oscars are Sunday. Oscar Parties, Balboa, Cerrito, Lark, Rafael, Roxie, Sunday, click on these theater links for starting times and more information. Yes, both the awards and the ceremonies tend towards the ridiculous. But the show is usually entertaining, and sometimes, the right film wins. And like movies themselves, the whole event can be much more entertaining on the big screen, especially when you add costume contests and/or prizes. The Roxie in particular promises a "meeting of malcontents gathered to vent right back at the Holly-white Boys Club bent on publicly patting itself for another year of mediocrity." You can read my Oscar party reports of passed years at the Rafael and Cerrito. Pre-Oscar Party, Magick Lantern, Saturday, 1:00. As a fundraiser to bring the theater back to life, the Magick Lantern will have an Oscar party a day early. They promise live music, Oscar ballots, a short film by Camille Cellucci, and Cellucci herself discussing how the Oscars are run. B- What We Do in the Shadows, Embarcadero, Shattuck, Rafael, opens Friday. This vampire mockumentary’s basic idea is funny and promising: An unseen documentary camera crew follow the afterlives of four vampires who share a house in a modern city. They argue about household chores, go out looking for victims, and talk directly into the camera about their undead but still active existences. But the basic idea begins to wear out around the half-way point. The jokes are still funny, but they come farther apart. From the creators of HBO’s Flight of the Conchords. Read my full review. A+ North by Northwest, Stanford,Thursday through next Sunday. Alfred Hitchcock’s light masterpiece, not as thoughtful as Rear Window or Notorious, but more entertaining than both of them combined. Cary Grant plays an unusually suave and witty everyman in trouble with evil foreign spies (who think he’s a crack American agent), and by the police (who think he’s a murderer). And so he must escape almost certain death again and again while chased from New York to Mount Rushmore. On the bright side , he gets to spend some quality time with a very glamorous Eva Marie Saint (danger has its rewards). On a Hitchcock double bill with The 39 Steps, which I haven’t seen in decades. 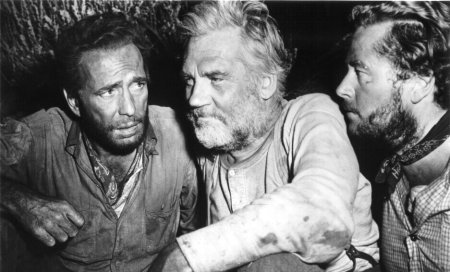 A The Treasure of the Sierra Madre, Balboa, Thursday, 7:30. Three down-on-their-luck Yankees (Humphrey Bogart, Tim Holt, and the director’s father, Walter Huston) prospect for gold in Mexico. They find and stake out a profitable mine before discovering that they don’t really trust each other. Writer/director John Huston, working from B. Traven’s novel, turned a rousing adventure story into a morality play about the corruption of greed, much of it shot in the remote part of Mexico where the story is set. A Galaxy Quest, Balboa, Wednesday, 7:00. There’s no better way to parody a well-known genre than to write characters who are familiar with the genre and find themselves living what they thought was fiction. And few movies do this better than Galaxy Quest. The cast of a long-cancelled sci-fi TV show with a fanatical following (think Star Trek) find themselves on a real space adventure with good and bad aliens. Tim Allen, Sigourney Weaver, and Alan Rickman star. The funniest film of 1999–one of the best years for comedy in recent decades. 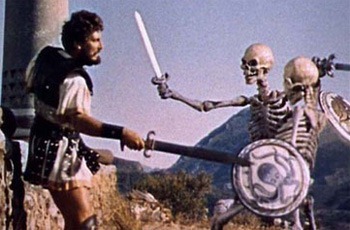 A Jason and the Argonauts (1963 version), Balboa, Saturday, 10:00AM. No other movie so successfully turns Greek mythology (or at least a family-friendly version of Greek mythology) into swashbuckling adventure, while remaining true to the original spirit of the tales. As the gods bicker and gamble on the fates of mortals, Jason and his crew fight magical monsters and scheming human villains. Todd Armstrong and Nancy Kovack are unbearably stiff in the lead roles, but Jason contains several wonderful supporting roles, including Nigel Green as cinema’s most articulate Hercules. But the real star, of course, is Ray Harryhausen’s hand-made special effects. Metropolis, Swedish American Hall, Friday, 7:00. I’m not giving this Metropolis screening the usual A, because the website gives it a 77-minute runtime. That’s about half the length of the so-called Complete Metropolis. This is even five minutes shorter than the Giorgio Moroder special edition. But even in a truncated version, the first important science fiction feature film should still strike a considerable visual punch. The images–workers in a hellish underground factory, the wealthy at play, a robot brought to life in the form of a beautiful woman–are a permanent part of our collective memory. Live accompaniment by Chrome Canyon. Part of the Noise Pop Film Festival. A Wild, New Parkway, opens Saturday, 7:20. Judging from this adaptation of her memoirs, Cheryl Strayed led a pretty wild life before she walked into the real wild and got herself together. This film adaptation of Strayed’s memoir follows her as she hikes the Pacific Crest Trail and learns how to be a fully in-the-moment adult human being. Interspersed with the hike, the film shows us flashbacks that reveal what sort of person she was before the difficult and dangerous three-month voyage. We learn about her struggling but loving mother who died too soon, and the self-destructive streak that destroyed Cheryl’s marriage. Read my full review. A- Birdman, Aquarius, opens Friday. Michael Keaton plays a has-been movie star, who may or may not have superpowers, hoping to gain artistic respectability by writing, directing, and performing in a Broadway play. Edward Norton plays an actor who already has the respect of critics, but is only fully himself when he’s on stage. Like Hitchcock’s Rope, Birdman pretends it was shot in a single take. But unlike Rope,the gimmick works this time around–better technology, I suppose. Much of the film is hysterically funny, but the picture is just a bit too long, and in the end it doesn’t quite satisfy. From Alejandro González Iñárritu, whose Babel was my favorite film of 2006. B Citizenfour, New Parkway, Saturday, 3:45 & Wednesday, 6:30; Roxie, Sunday through Tuesday. Laura Poitras’ camera puts us in the Hong Kong hotel room where Edward Snowden tells Glenn Greenwald about the NSA’s horrendous destruction of our privacy. Those four days of interviews make up the film’s centerpiece. 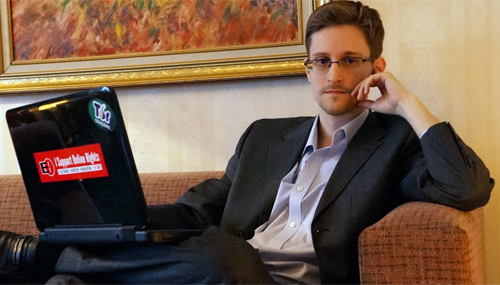 Snowden comes off mostly as a self-effacing nerd who understands right from wrong. But the long discussions in the hotel room become visually boring, despite the important and fascinating story at their core. Read my longer essay. B+ The Imitation Game, Lark, opens Friday. This very British biopic takes considerable liberties in dramatizing the life of Alan Turing. For instance, he appears to have severe Asperger, when the real Turning had nothing of the sort. But it successfully result s in an effective, entertaining, and sympathetic tragedy about a man who played important roles in both winning World War II and laying the groundwork for computers, but was hounded to suicide by an intolerant society. Like so many English period pieces, The Imitation Game works primarily as a showcase for actors. Cumberbatch does a variation on his Sherlock Holmes, but he digs deeper here. His emotional struggles are more real. Keira Knightley plays the only woman on his team. See my longer article. C+ Alfred Hitchcock double bill: Vertigo & The Trouble with Harry, Stanford,Thursday through next Sunday. The C+ goes to The Trouble with Harry. Alfred Hitchcock laced his thrillers with humor, but his second and last attempt at an out-and-out comedy succeeds in merely being pleasant–despite the Hitchcockian theme of a dead body that everyone wants to hide. Although Vertigo is officially now the greatest film ever made, I can’t give it more than a C-. Neither the story nor most of the characters make any sense, and I don’t believe anyone’s motivations. Yes, the film is very atmospheric, but that’s just not enough.